The Bartlett School of Architecture's Digital Manufacturing Centre (DMC) recently collaborated with Bartlett alum Tobias Klein and Adobe to create 375 Park Avenue, a re-contextualisation of the iconic Seagram Building. Klein's design of 375 Park Avenue (pictured) takes the form of an elaborate architectural provocation, fusing anatomical data of the author with the modern language of architect, Mies van der Rohe. By using MRI scans of his own body as the basis to design a digital embodiment, 375 Park Avenue questions today’s seemingly obsolete modern credo of form follows function and instead opens a line of inquisition regarding the contemporary condition of embodied space in a a post-natural state. 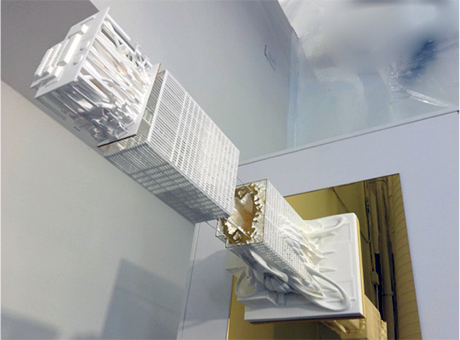 The model was 3D-printed by Martin Watmough of The Bartlett's DMC London using selective laser sintering (SLS). The work was displayed at the recent 3D Printshow in New York sponsored by Adobe.